Early afternoon of March 16, 1971, I took off in a 747 from Paine Field to do some air testing and to shoot some ILS approaches at Moses Lake. Moses Lake is about 300 miles east of Paine Field and has a good ILS System and a long runway which we used for practice landings. The weather at Paine Field was clear with only scattered clouds. After the ILS at Moses Lake, I headed back for Paine Field and climbed to 31,000 ft. About 80 miles east of Paine Field I started my descent. I throttled the engines back to idle and listened for the weather at Seattle. It was broadcast from Seattle Tacoma Airport. The weather was reported as scattered to broken clouds at 3,000 feet. I looked at the weather radar and no heavy weather was on the screen. We entered clouds at about 14,000 feet. I didn’t think descent through the clouds would take very long so at first I didn’t turn on the engine anti-ice. Then it got darker and darker so I had the engine anti-ice turned on. We entered an area of intense moisture which was a combination of rain and ice. Then Dave Gunn, a Pratt and Whitney engineer, who was riding in the jumpseat behind me said, “Look at engine number three”. I looked at the EGT and it was rising above 600 degrees, so I shut the fuel off to that engine to keep it from overheating. Then engines four and two began to overheat, so I gave them the same treatment. Fortunately engine number one did not have to be shut down. I began to think I might have to glide to Paine Field or ditch in Elliot Bay. I was a very busy man. Our flight engineer, Loren Cunliffe, was very busy too. He had to juggle our electrical power around to keep from losing it all. When the engines spooled down the generators dropped off the line. If we had lost engine one we would have been down to battery power which isn’t much. But we didn’t, and after descending through 5,000 feet the weather was clear and the engines were all ok.
Didn’t have to ditch in Elliott Bay. The incident was serious and was reported to the FAA. 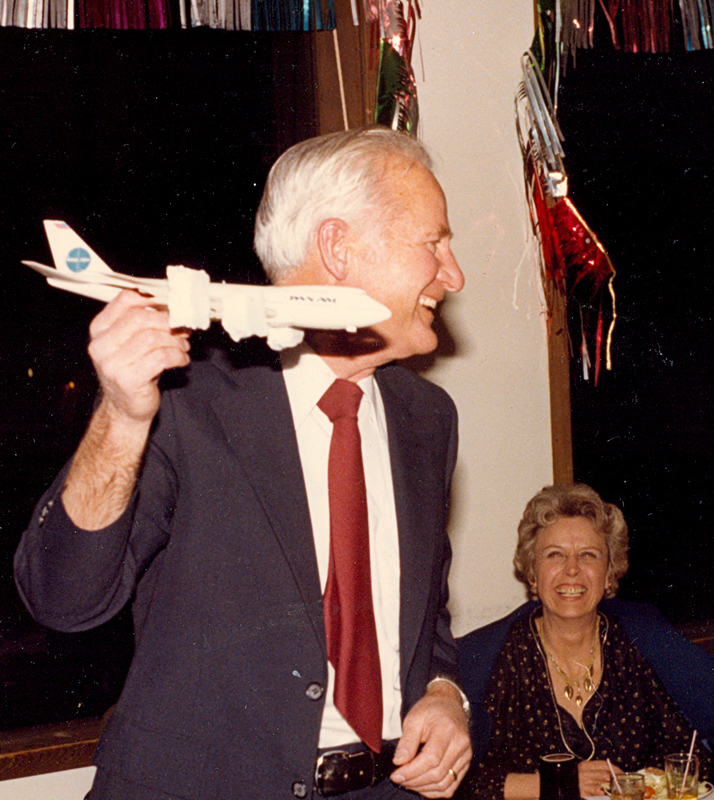 Photo was taken at Jim’s retirement party with a replica of the incident, complete with ice cubes on the three engines.